The HFRX (Hedge Fund Research, Inc) Global Hedge Fund Index was down 19.6% for the year as of October 30th, 2008 (link below), confirming fears that the losses sustained by the global hedge fund industry were deeper than many were letting on. The HFRX indices are seen to be more comprehensive than other hedge fund tracking indices that are available to the public. October was a particularly painful month for the HFRX Global Hedge Fund Index. The Index was down 9.05% in October, making for one of the worst months ever in the history of the hedge fund industry. 2008's performance is particularly bad compared to the results seen from the past 4-5 years. 2007 saw a return of 4.23%, 2006 saw a return of 9.26%, 2005 was 2.72%, 2004 was 2.69% and 2003 was 13.39%. The heavy losses sustained by many hedge funds across the globe have sent investors scurrying into the comfort of cash. Investor redemption requests have been particularly heavy this year, sending funds scrambling to try and cope with the exodus of capital. Many of the "top funds" are having unbelievably bad years as well - barely anyone in the hedge fund industry has been able to sidestep this global market meltdown. SAC Capital and Citadel are two of the major hedge fund companies that have had historically poor years. The HFRX Equal Weighted Strategies Index is down 18.23% for the year, while the Market Directional Index is down 23.39%. The HFRX Convertible Arbitrage Index had a particularly nasty month in October, losing over 36% of its value. The index is now down 52.22% on the year. The Distressed Securities Index, Equity Hedge Index, Event Driven Index and Relative Value Arbitrage Index have all had nasty years as well (drops of 16.6%, 22.44%, 19.36% and 29.53% respectively). There are a few glimmers of green: the Equity Market Neutral Index is up 0.477% on the year, while the HFRX Macro Index is up 1.45%. HFRX's Global Currency indexes are down across the board as well. 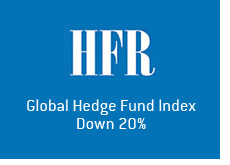 The HFRX Global Hedge Fund EUR Index is down 20.27% YTD, having dropped an impressive 10.38% in October. The JPY, CHF and GBP indexes are all down approximately 20% YTD. While the Global Hedge Fund Index is "only" down approximately 20% for the year (compared to the 40%+ drubbings that many global equity markets have taken), this is still an unbelievably bad year for the hedge fund industry that will lead to many fund closures.